Over the last two weeks, we got to know James Hendrie of St. Croix (see here and here). It seems that James Hendrie had lived on St. Kitts when Rachel Faucett and James Hamilton met and formed a relationship there. He then moved to St. Croix in or just before 1758 and in 1759 was summoned to testify at the divorce of John Michael Lavien and Rachel Faucett. But in 1760 or so, he went bankrupt and disappeared from the island’s records. Nearly a decade after his bankruptcy and disappearance from St. Croix’s records, a James Hendrie appears again in the island’s files. The earliest of these records bears a date of January 1769. Whether this was the same James Hendrie or a different one is not known with certainty. The records that have been discovered provide no link between this later James Hendrie and the earlier one. As the name James Hendrie was not so common, one would assume that this later person was the same as the earlier one. This James Hendrie of 1769 was a carpenter, not a merchant like the previous man of the same name. This might suggest that this was a different James Hendrie. Alternatively, having failed as a merchant, as we saw last week, James Hendrie may have turned to a more menial occupation. Additionally, it is possible that Hendrie had been a carpenter even back in 1758 and 1759 but had also speculated on mercantile ventures, a means of investing one’s savings, and thus he appeared to be a merchant at that earlier date. 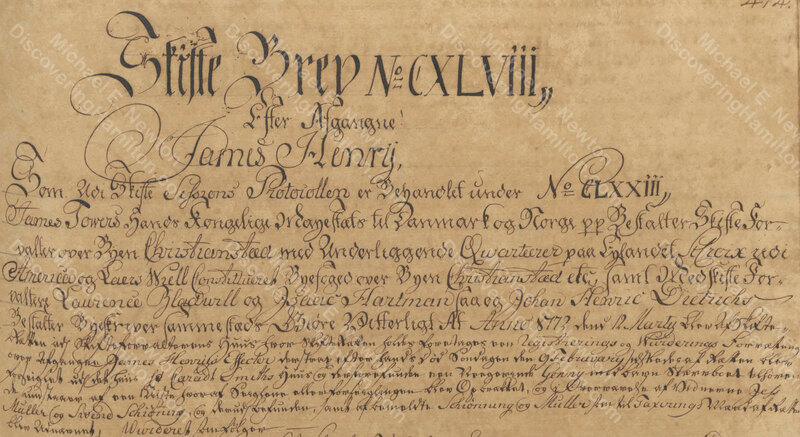 Despite clearly being on St. Croix for some time and owning at least one slave according to his probate record, this James Hendrie never appears in the island’s matrikels. This could be seen as supporting the possibility that the original James Hendrie had stayed on the island the whole time and that this new James Hendrie was the same person. In July 1771 and again in December, James Hendrie fell ill.
Again in January and February 1772, James Hendrie was sick. James Hendry died on Sunday, February 9, 1772, and the probate court took up the matter of his estate on March 12. When James Hendrie’s estate was settled on April 28, 1773, after the usual year of allowing creditors to submit claims, it was found that the estate had credits of 694 rigsdalers, 1 real, and 2 styvers versus debits of 1,360rdl 5r 4st. As a result, his estate had “fallen” short or was “bankrupt” to the tune of 666rdl 4r 2st. If this was the same James Hendrie as the one who lived on St. Croix in the late 1750s, it was the second time he had gone bankrupt. And it will be recalled that his father had gone bankrupt as well. After investigating the life of James Hendrie, one of the three people summoned to testify at the divorce of John Michael Lavien and Rachel Faucett, one thing should become clear: there is much that we don’t know. Unlike with Jemima Faucett Iles Gurley and James Ash, the two other people summoned to testify at the divorce hearing of John Michael Lavien and Rachel Faucett, no record has been found of James Hendrie interacting with anyone involved in the divorce, though there is a record of William Hendrie, James Hendrie’s father, paying Mary Faucett, Rachel’s mother, to do some sewing. Moreover, it is not even clear if the James Hendrie on St. Croix in the late 1760s and early 1770s was the same James Hendrie who had been on St. Croix in the late 1750s, but I believe that they were. In this case, even more so than in the cases of Jemima Faucett Iles Gurley and James Ash, more research would need to be done to achieve a better understanding of James Hendrie’s involvement in the affairs of Rachel Faucett. And in this case, where James Hendrie and Rachel Faucett appear to have been connected on St. Kitts, research in the records of that island rather than those of St. Croix may yield the links that we are looking for. As a result, this blog post and the research behind it may seem to have been a big waste of time for those interested in Alexander Hamilton. 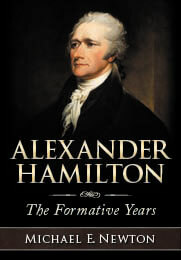 Much has been found about James Hendrie, but this adds little to our knowledge regarding Alexander Hamilton and his family, in sharp contrast to the discovery of Hamilton’s aunt Jemima Faucett Iles Gurley and his more distant relative-by-marriage James Ash. On the other hand, this blog post demonstrates how much time and effort can be spent researching such topics and how some of them bear little or no fruit. Nevertheless, a firm foundation has now been established and hopefully records concerning James Hendrie will be found, a fuller picture of his life will develop, and his relationship to James Hamilton and Rachel Faucett will emerge. Additionally, this James Hendrie (if the two James Hendries are the same person) was on St. Croix at the same time as Alexander Hamilton in the late 1760s and early 1770s. Alexander Hamilton may have known this man, and if Hendrie had anything to do with Rachel’s earlier life, there may be an interesting story waiting to be discovered. James Hendrie appears in some of St. Croix’s Hovedboger (account books) and elsewhere in the years following 1760, but most of the entries regard exiting debts and none of the new transactions definitively place him on the island. One assumes that James Hendrie had rented out this slave and that the renter paid the taxes. “Fallit” in Danish could be translated as either “fallen” or “bankrupt.” In this case, either translation would be accurate. © Posted on October 22 , 2018, by Michael E. Newton. Please cite this blog post when writing about these new discoveries.